I wanted to try making turkey gravy in advance this year and found a recipe on Food Network that looked great. I stayed very close to the original recipe although I did let it simmer for longer to make it extra flavorful. 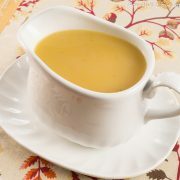 The gravy was really quite easy to make, tasted fantastic, and has reduced stress for the upcoming holiday. I love that! 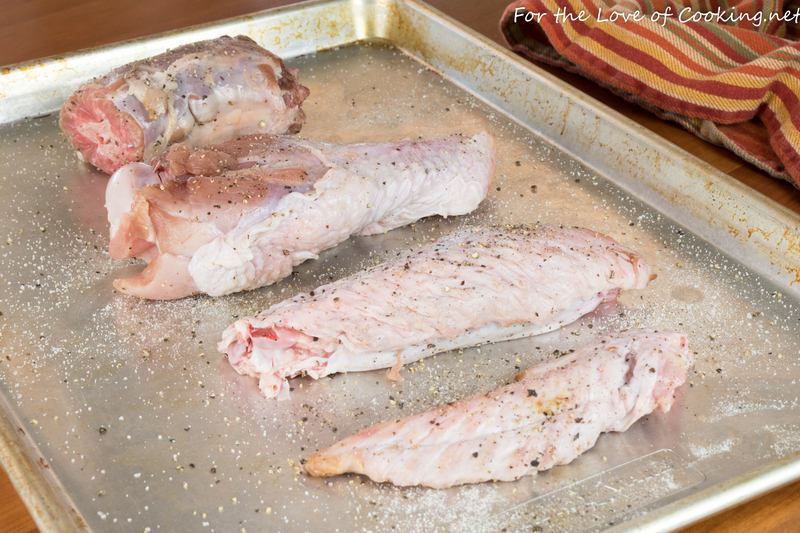 Put the turkey pieces on the baking sheet then season them well with sea salt and freshly cracked pepper, to taste. Place into the oven and roast until browned and cooked through, about 30-35 minutes. Remove from the oven. Transfer the roasted turkey pieces to a heavy bottomed stock pot. 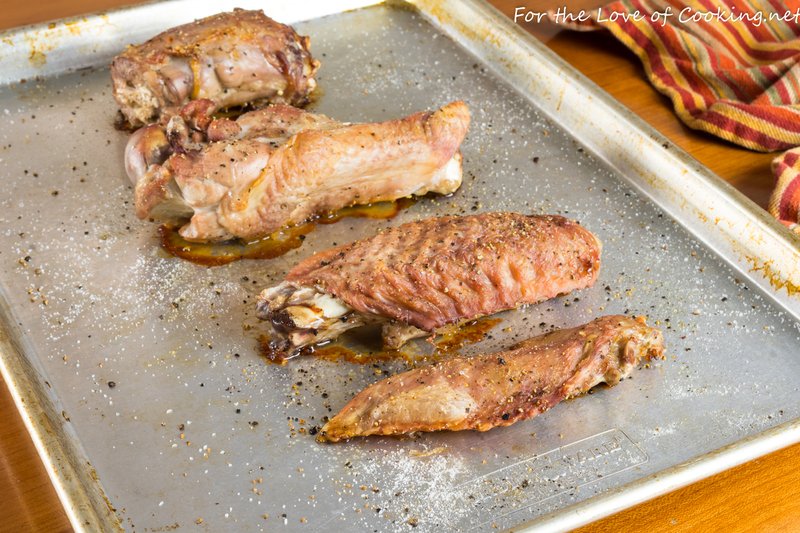 Pour 1 cup of turkey broth on the baking sheet and carefully scrape up all the browned bits from the bottom of the baking sheet. Carefully pour the liquid and scraped up bits into the stock pot along with the remaining turkey broth, thyme sprigs, bay leaves, and smashed garlic clove. Bring to a simmer, then cook for 30 minutes uncovered. Cover with a lid and continue to simmer for another 30-45 minutes to really enrich the broth with roasted-turkey flavor. Strain the liquid into a heat-safe bowl though a fine strainer or cheesecloth. Melt the butter in a saucepan over medium-high heat. Add the flour, and whisk until the mixture is smooth, toasted, and a deep golden brown color. This step is important so your gravy doesn’t taste like flour! Slowly pour the warm broth, whisking continuously, until the mixture comes to a simmer. Continue to cook, still whisking, until the gravy is thick and coats the back of a spoon, about 5-7 minutes more. Taste and season with sea salt and freshly cracked pepper, to taste. Let the gravy cool to room temperature then pour into an airtight container or zip lock freezer bag. Seal, label, date, and freeze up to two weeks or refrigerate up to two days. You can also serve it immediately. Enjoy. Transfer the roasted turkey pieces to a heavy bottomed stock pot. Pour 1 cup of turkey broth on the baking sheet and carefully scrape up all the browned bits from the bottom of the baking sheet. Carefully pour the liquid and scraped up bits into the stock pot along with the remaining turkey broth, thyme sprigs, bay leaves, and smashed garlic clove. Bring to a simmer, then cook for 30 minutes uncovered. Cover with a lid and continue to simmer for another 30-45 minutes to really enrich the broth with roasted-turkey flavor. Strain the liquid into a heat-safe bowl though a fine strainer or cheesecloth. Add the flour, and whisk until the mixture is smooth, toasted, and a deep golden brown color. This step is important so your gravy doesn't taste like flour! Slowly pour the warm broth, whisking continuously, until the mixture comes to a simmer. Continue to cook, still whisking, until the gravy is thick and coats the back of a spoon, about 5-7 minutes more. 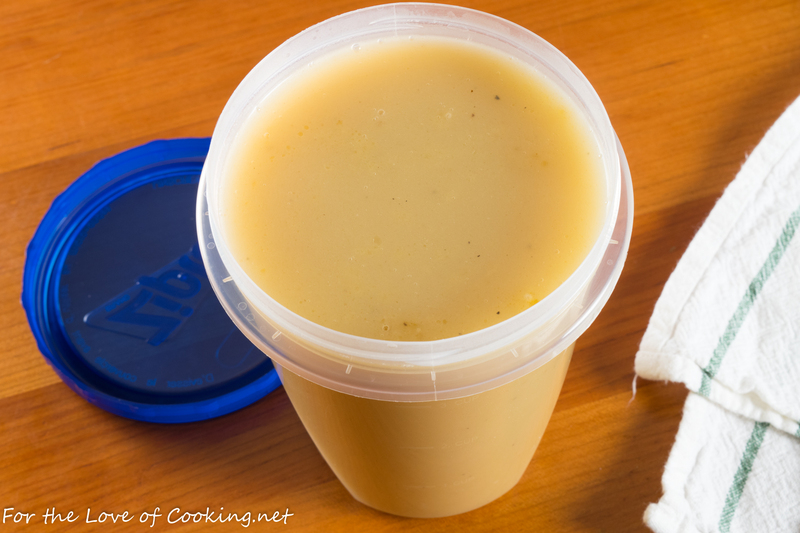 Let the gravy cool to room temperature then pour into an airtight container or zip lock freezer bag. 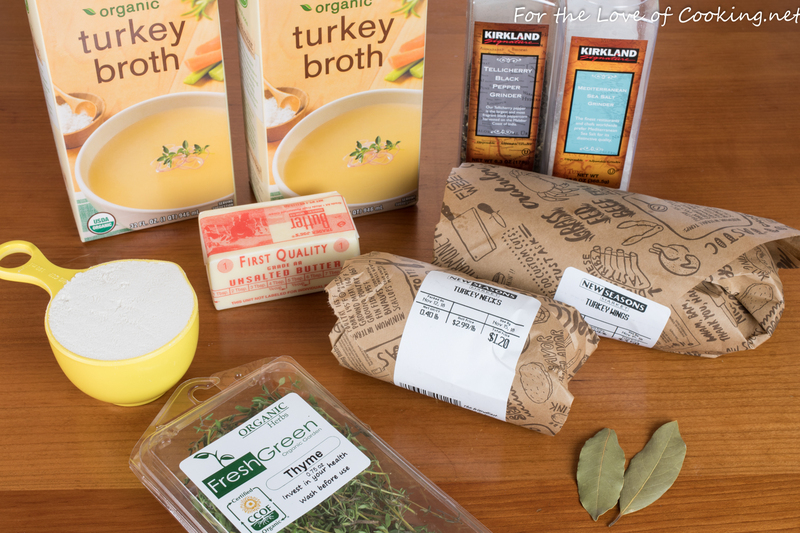 Seal, label, date, and freeze up to two weeks or refrigerate up to two days. You can also serve it immediately. Enjoy. 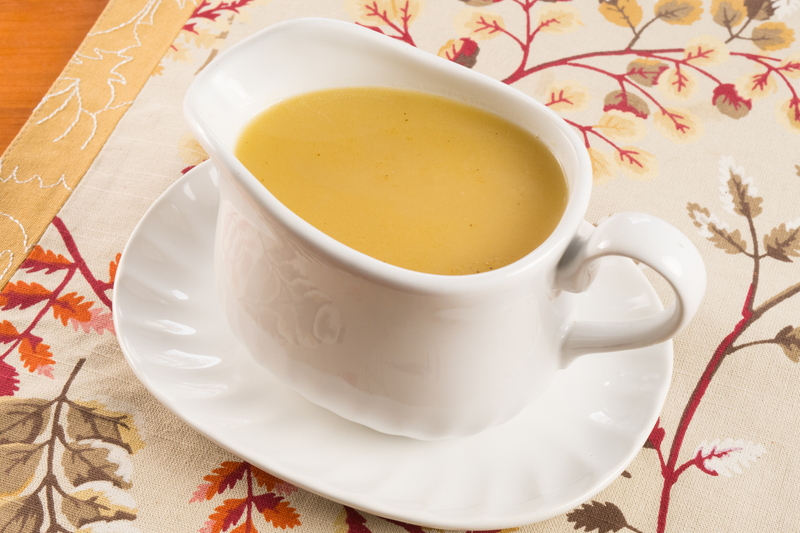 Great idea to make the gravy ahead. Saves lots of time . Make ahead gravy is a life saver. I usually use Michael Symon’s recipe that I saw on “The Chew.” I’ll keep yours in my back pocket too.